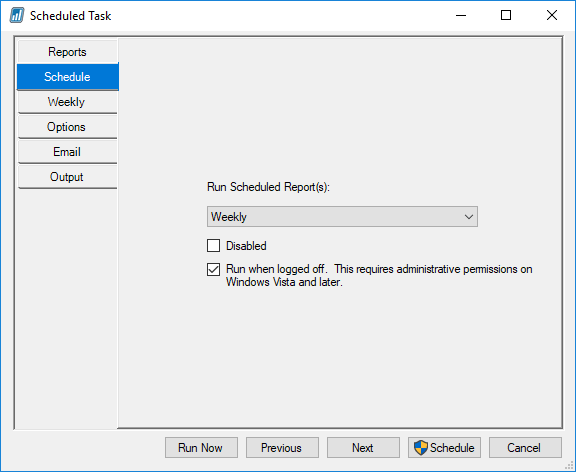 The Jet Scheduler is a powerful tool that allows you to schedule reports to be automatically run by the Windows Task Scheduler. 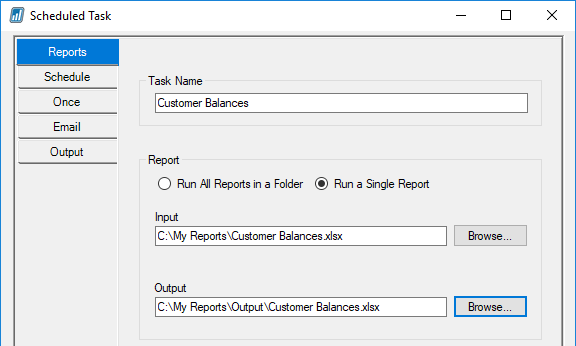 You can also control where the output file is saved, if the report should be emailed once it has been generated, and the output format of the report. Listed below are the steps necessary in using the Jet Schedule. To set up a scheduled report, open the report in Excel, click the Jet ribbon, and click the Schedule button. Click the New Task... button to schedule a new task. Task Name: This represents the name of the task as it will appear in the Scheduled Task window. 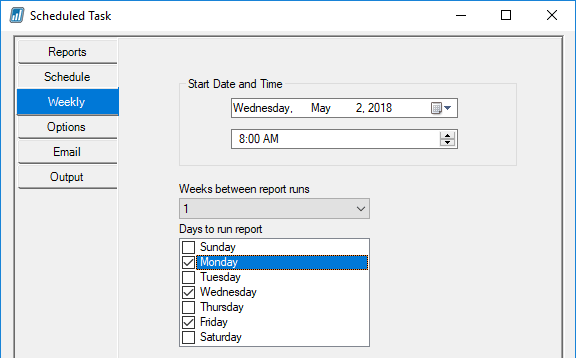 The Schedule tab defines the frequency of how often the report will be run as well as if the task is currently disabled and if the report should be run when you are logged off. The name of this tab will change depending on the frequency specified on the Schedule tab. In the image below, a Weekly frequency has been specified. The Email tab allows you to define who the report will be sent to if emailing is desired. 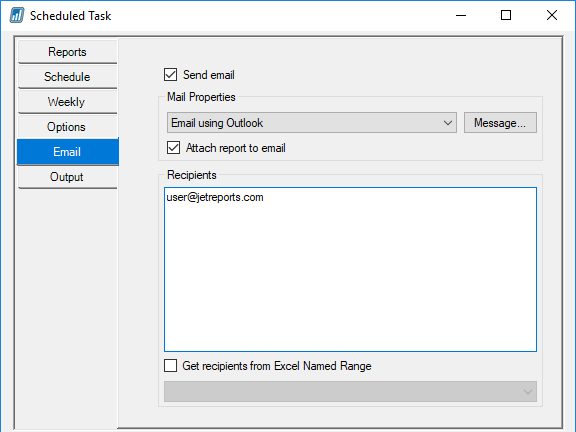 Mail properties: This drop-down will allow you to specify whether the report will be emailed using Outlook or using the more generic Simple Mail Transfer Protocol (SMTP). SMTP must be pre-configured in the Application Settings in order for it to be used. Recipients: Email addresses will be specified here for all recipients of the report. Email addresses should be separated by a semi-colon. Get recipients from Excel Named Range: It is possible to also define the email addresses in the report itself and then assign an Excel named range to the cell(s). If there are named ranges in the report then they will appear in the dropdown below the checkbox. 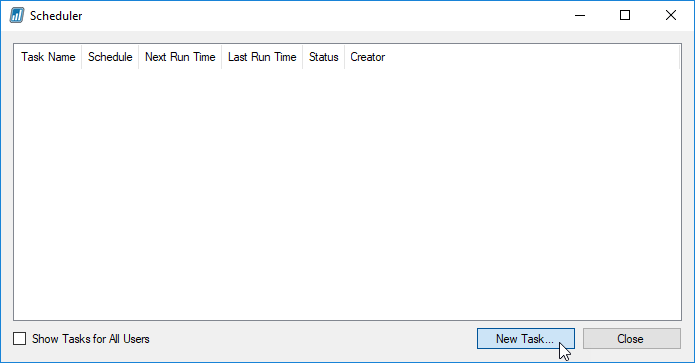 The Output tab allows you to define how the file should be saved once it is finished running. 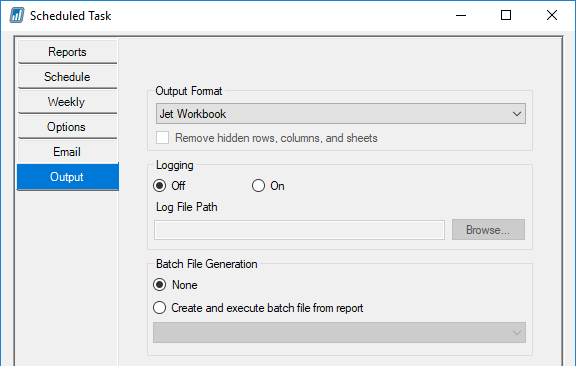 This tab also provides you with the ability to turn on logging to troubleshoot errors with the Scheduler process, as well as to use Batch File Generation for the reports.